How Easily Can Leaders Change Their Leadership Style? Apple CEO Tim Cook's leadership style is often described as methodical and no-nonsense. Unlike his maverick predecessor, Cook appears to delegate more effortlessly. While Cook's leadership has been able to sustain already profitable iPhone and iPad product lines, his leadership has yet to yield the next ground-breaking product. Yahoo's Merissa Mayer and Microsoft's Steve Ballmer have respectively been branded with words such as autocratic and dictatorial at some stages in their leadership tenures. The core question stands—How easy is it for leaders to change their leadership style? Leading people and situations is not a one-size-fits-all game. Leadership styles evolve, and different situations demand the demonstration of different styles. That is what the Hersey-Blanchard Situational Leadership® Theory is based on. 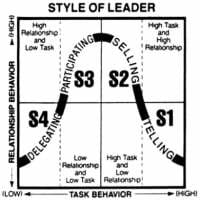 It promotes the situational leadership model (shown above), which means that the theory focuses on the situation a team is in and the maturity of subordinates to arrive at what is closest to the right leadership style for a given situation. Based on the leadership situation to address, the leader is expected to vary the degree of two aspects of managing—task orientation and people orientation. For example, if a follower is of low maturity, then the model suggests having a high task orientation and high relationship orientation. This model is widely used to teach the nuances of leadership. On the contrary, it makes one basic assumptio: A leader can learn to adapt to a new style or switch leadership style quite quickly. While it may be natural for some, for the majority it is not so effortless to evolve the leadership style from moment to moment. Leaders will really have to act like someone else when not dealing with their natural styles. Strength-based leadership provides a different perspective when looking at the core question of changing leadership styles. While Hersey-Blanchard argued that leaders should change their style based on the maturity of followers and work situations, strength-based leadership proposes that people would rather be placed in jobs that they are most passionate about and where their strengths are aligned. Once a leader manages to achieve this, the leadership style that needs to be assumed is to empower rather than to be task oriented. While it is arguable whether this approach can be applied to all work situations, the strength-based leadership model does hit the nail on the head when it says, "Leadership means encouraging people to live up to their fullest potential and find the path they love." Leaders like Steve Jobs and Bill Gates, who really drove their respective organizations from being garage-based startups to massive conglomerates, have achieved success based on the strength of their leadership, among other things. They have really led through different business situations as denoted by the STARS framework. Each of these business situations required a different leadership style—from a hands-on expert, know-it-all person at a startup to an inspirational, direction setter, strategy maker of a sustaining-success firm. The legendary leaders mastered the art of situational leadership better than their lesser-mortal counterparts. Anuj Magazine is a software testing and general management professional at Citrix Inc. He regularly shares his knowledge and experiences as a conference speaker and writes frequently on diverse topics like software testing, management, sports, and handwriting analysis. Anuj runs ASM, a non-profit organization that contributes to society by counseling and mentoring people using the science of handwriting analysis.